PC gamers might remember the flurry of Doom clones that just seemed to never end in the mid-90s. While a lot of them didn't try to break with the winning formula too much or only put a mild spin on it, where others put enough spin to make you motion sick and, at first, disoriented. Interplay's Descent was one of these, zagging where others zigged. Instead of throwing you in a series of dimly lit space corridors with a shotgun, it plopped you inside the cockpit of a spacecraft into the depths of the dimly lit corridors of planets with a laser. The full 360-degree movement took quite a bit of getting used to, but a flight stick later and you'd find yourself in one of the better shooters of the era. The wording of the press release indicates that it'll be the original 1995 game brought over and not a new sequel/prequel. Then again, stranger things have happened. Developer G1M2 is behind the WiiWare effort. They recently dropped the Data East Arcade Classics on Wii, so it's safe to say they know a thing or two about old games, or at the very least have a passing acquaintance with them. (April 14th, 2010) — Interplay Entertainment Corp. and G1M2 will partner to bring the classic Descent to the Wii. “Descent remains the most popular 1080º 3D blasting game. Translating its 3D worlds and game play to WiiWare™ is an exciting move”, said Hervé Caen, CEO of Interplay. “Descent will pair perfectly with the motion sensing Wii Remote™ controller and we can't wait to show players how intuitive the game play and control can be” seconded Scott Hawkins, the Founder of G1M2. Descent is expected for initial release during Fall 2010 and is planned for electronic distribution through Nintendo's WiiWare™ service. “Following Clayfighter DSiWare™ & WiiWare™, and Stonekeep WiiWare™, Interplay continues to redevelop its fantastic portfolio of games,” Hervé Caen concluded. Can't frakking wait! I LOVE floaty 3D shooters! . Why does the article suddenly cut off? Does this include lost vikings??? Löööööve that game. Wow! Now this is a trend I will defintly approve. Someone call up whoever has Microprose game rights, I want X-Com on Wiiware! Awesome! I actually just heard of this fairly recently, and I've been wanting to play it. I didn't see this one coming. Please work and please be good. Wow, I didn't expect this. Descent was quite good, but it seems to have been filed away under "failed experiment" in the minds of many, so I never imagined it making a return. The controls will make or break this one, I think. Quite unexpected but still a good match. I look forward for this one. I'm Darklinkinfinite and I approve this message...and the porting of classic PC games to WiiWare. or at the very least release Doom 64, Hexen, Duke Nukem 64/Zero Hour, etc on the Virtual Console. I never got to spend enough time with those when they were new. YES!!!!!!! I;m surprised they didn't do an Xbox Live Arcade port, though. I wonder if it'll have online? K, mildly excited about this, but I will be elated if they eventually release Descent: Freespace as WiiWare. Wow that was very unexpected. I never played that game but I remember they used to mention it on some PC Games magazines of the day. Could be cool, wondering how well it will control. Would also be nice if it was enhanced in some way like at least graphics. An online mode would be killer too. If the graphics are good I'll get it. Descent was a great game, not just a decent one. That's just frikkin awesome! I hope to see other classic PC games ported to WiiWare. One of my very favorite PC first-person shooters coming to WiiWare? Out of freakin' nowhere? Count me in. _ I'm just hoping the developer can really nail a great system of controls that feels as fluid if not more than a PC joystick. Time will tell, I suppose. Looking forward to it! I love this game. I look forward to playing more than the 7 levels available in the demo and with Wii motion controls and a modern online system (the original has online play but only by LAN or direct dial-up with the other player). I have to think there will at least be some kind of additional play mode like Phalanx in Japan - I believe Nintendo has a policy of not allowing VC content as WiiWare (hence denying Intellivision Lives as a DSiWare release). I never did play Descent, but I played (and loved) Forsaken which I hear is similar. How well will it work with Wii controls... can't wait to find out. Hopefully there will be online too. I missed the Descent series until Descent: Freespace, but I fondly recall this style of gameplay from Forsaken. This is a surprise! I was a fan of the original, I hope it this version turns out great. Can't wait! I LOVED Descent when I was like 12! This makes me happy. I said I was excited before but whenever I scroll past this article I get re-excited. I loved Descent and Descent 2 back in the day, this just made my day one purchase list. Gauss Cannon activate! Better graphics and Im there. 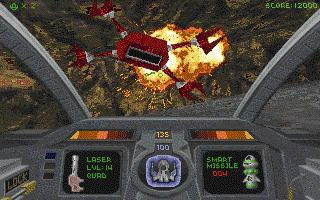 Descent was awesome in the day; a full-on textured 3D shooter while Quake was still glint in John Carmack's eye. You just needed to be able to think in six degrees of freedom to get the best out of it, which I think limited its appeal somewhat. Still, if they can get the controls right, and preferably get some good bonus content in too, this looks like a sure fire hit to me. Actually, John Carmack has had interests in developing for the Wii before. It would be nice to see more old PC games hit the wii. Day of the Tentacle, anyone? Welcome to the new virtual console. I usually spend a good chunk of my time with any new computer I get trying to figure out what hacks and emulators to use to get Descent to run right with a good joystick (Keyboards rarely make good game controllers for me). I would love to play this game with an easy intuitive control system. So, technically, this should be Virtual Console, but since they're tweaking the control system it's now WiiWare. Whatever. There are many great games out there that have barely been played in 20 years just because of legal nonsense or other lame reasons to not republish. I would also love to see Daggerfall get polished up to Nintendo standards and re-released for the Wii (though it might be a half GB). 2012 now and still no sign of it, but supposedly it's still coming now that Interplay has got their *&^% together again, along with the release of the long awaited Descent 4. Keep your fingers crossed for this one guys.